Successful body building combines proper intensity and training volume for optimal muscle growth. Due to the inverse relationship between intensity and volume, sets per body-part must balance both factors. Intensity refers to load lifted while volume defines total work completed per session or week. Inadequate set completion hinders bodybuilding results and should be considering during program design. Training variables include weightlifting load, amount of intra-set repetitions and number of sets performed. According to the American Council on Exercise, the product of load, reps and sets equals training volume. Instead of prescribing a universally specific number, volume evaluates your program over time and should be recorded for each session. Muscular balance and safety requires similar training volumes for each muscle group; for example, body builders focus equally on upper- and lower-body muscles . Bodybuilding focuses more on muscle growth and symmetry and less on optimal strength development. Growth occurs when weightlifting-induced muscle damage results in larger fibers after repair. Therefore, lifting loads must be heavy enough for fiber damage and light enough for repeated effort:one repetition with 20 pounds causes less damage than lifting 10 pounds for five repetitions. Bodybuilders solve the training-volume dilemma by performing numerous sets with moderate loading and repetitions, as stated by ACE. Bodybuilding requires lifting loads of 70 to 80 percent maximal ability during 8 to twelve repetitions, says ACE. As a rule, if you can lift your chosen load, with good form more than twelve times, you are likely using a load below 70 percent maximal ability -- which does not target bodybuilding adaptations. In addition, the American College of Sports Medicine suggests short rest periods -- of 30 to 90 seconds -- between sets for optimal muscular definition and metabolic intensity. Performing up to six sets per exercise enables great volume for all muscle groups. In addition, bodybuilders often target similar muscles with multiple exercises per session; performing two different bicep, or arm, exercises in a row further enhances training volume for that muscle group. Remember, repeated effort -- with proper loading -- contributes to desired muscle fiber damage and subsequent growth. 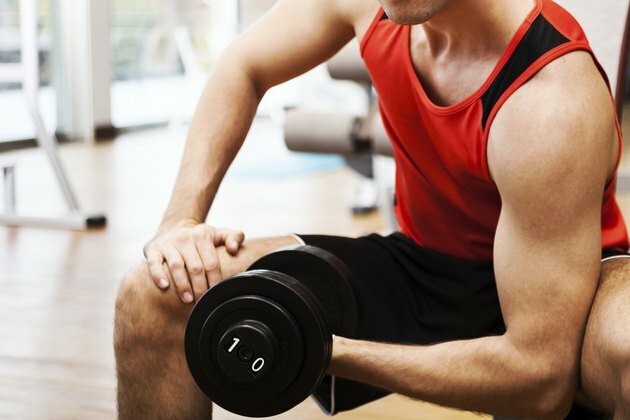 The ACSM advises against high-volume weightlifting for beginners. Instead, you should introduce resistance training with one or two full-body workouts per week and add additional sessions after one to two months. Before beginning any workout, a warm up period of five to 10 minutes of low-intensity cardio, such as cycling, plus one or two sets with light weights, warms up your muscles and helps prevent injuries. According to ACEM, successful bodybuilding requires two to three lifting sessions, per muscle group, per week and can be accomplished with three whole-body workouts or four to six split-routines per week. Split routines occur when different muscle groups are worked on different days. As always, consult a doctor before beginning a workout program.